Annual or biennial herb 15 to 60 cm tall Stem: erect, somewhat bushy with many forked, ascending branches, leafy, spreading-hairy, some of upper internodes with gland-tipped hairs. Leaves: opposite, stalked, 2 - 7 cm wide, angular-rounded (like a pentagon) in outline but very deeply palmately five-lobed, with lobes narrowed at base and further deeply lobed most their length. Flowers: purple, long-stalked, small (under 1 cm long and 2.5 cm diameter), radially symmetric, and in pairs atop glandular-hairy axillary stalks. 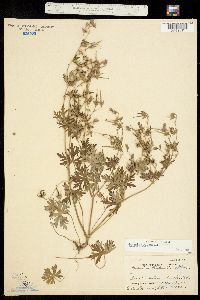 The two flower stalks at the tip of each main stalk are over twice the length of the sepals, and these stalks are closely subtended by very small bracts, and further the stalks are covered with long, glandular hairs. Sepals: five, alternate with petals, green, hairy along edges and nerves, less than 1 cm long, broadly lance-shaped with tip narrowed into a stiff, 0.7 - 3 mm long bristle. Petals: five, purple, up to 1 cm long (about same length as sepals), inversely egg-shaped with narrowed base and notch at center of the wide, flattened to shallowly rounded tip. Next to the base of each petal there is a gland, thus making a ring of five glands alternate the petals. 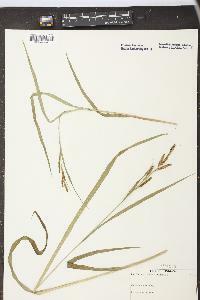 Stamens: ten in two series, all fertile, with filaments widened at base, and up to 1 mm long anthers. The ring of five longer stamens are aligned with the petals, while the five shorter stamens are alternate with the petals Pistil: with a single, deeply five-lobed, superior ovary; one elongated style column; and five linear stigmas. Fruit: five, erect, dark-hairy, non-glandular, 1.5 - 2.5 cm long, single-seeded, rounded base, beaked, nutlike segments surrounding remnant elongated style column of each flower. Each nutlike segment has a 3 - 5 mm long, narrowed beak at its tip, which is attached to the lower part of the style column, and then is pulled upwards by the coiling outer wall of the style column, yet stays attached to the entire fruiting structure and ejects the seed from the main body of the nutlike segment. 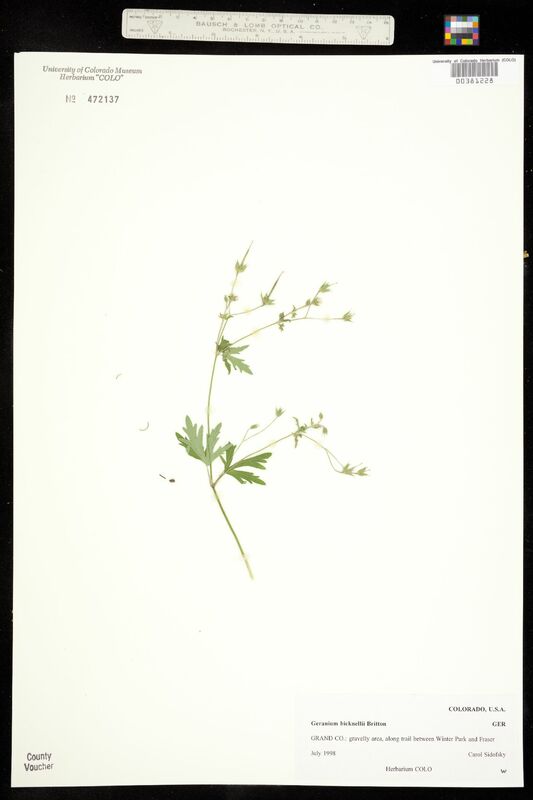 Similar species: Geranium bicknellii is very similar to the European G. columbinum, but that species has the flower stalks with only tiny, down-curved, non-glandular hairs, and the nut-like portion of the fruit is normally hairless. Another similar non-native species is G. thunbergii, but that species is a perennial with a stout rhizome, it does not have long apical bristles on the sepals, and the slender, apical beak of the fruit is less than 1.5 mm long. 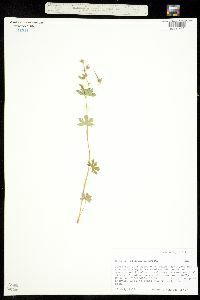 Other species of Geranium with bristle-tipped sepals have the individual flower stalks less than twice the length of the sepals, and the narrowed apical beak of the fruit is less than 2 mm long. Habitat and ecology: Very rare in the Chicago Region, normally only found in sandy soils of oak woods or savannas, especially those having just experienced fire. Etymology: Geranium comes form the old Greek name for a crane geranos, referring to the long beak of the fruit resembling a crane's bill or beak. Bicknellii is most likely named after Eugene P. Bicknell, 1859 - 1925, an American botanist who worked quite a bit in the eastern United States. In sandy soil in burned over black and pin oak woods. Frequent where found and always associated with Corydalis sempervirens and sometimes with Epilobium angustifolium. Large specimens may be three feet in diameter. Erect annual or biennial, usually with many ascending branches, eventually to 5 dm; lvs pentagonal, the principal ones cleft nearly to the base with usually 5 segments, these deeply incised into several narrowly oblong lobes; peduncles 2-fld, the elongate pedicels glandular- villous; sep at anthesis 7-9 mm including the conspicuous subulate tip; pet retuse, equaling the sep; mature fr, including the cal, 20-25 mm, the stylar beak 4-5 mm, the carpel-bodies 3 mm, sparsely hirsute, not wrinkled. Open woods and fields; Nf. and Que. to B.C., s. to N.Y., Pa., Ind., Mo., and S.D. May-Sept.